Dragonfly Environmental is the key consultant for advising on the retaining and creating new habitat of native animals as part of the Sydney Park water reuse scheme. The scheme aims to improve water circulation and retention thus drastically improving the quality of the system. 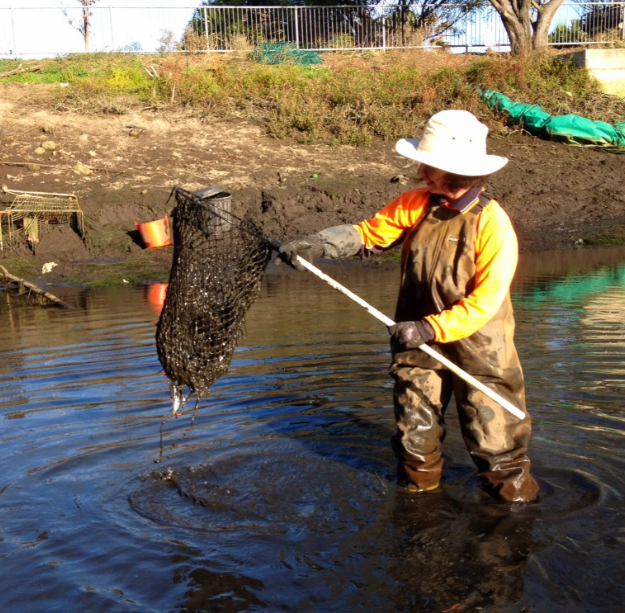 We are currently working to move native animals from wetlands that are being drained (so they can be upgraded) to other wetlands within Sydney Par k. Here we are catching and relocating Eels and Long-necked Turtles. For decades now chemicals have been administered into public spaces quite readily with the assumption that they are safe for the people who use them, those who use the spaces and the environment. Quite recently there has been a change to this thinking and Australian Councils across the board are beginning to rethink the use of chemicals. Councils are investigating alternatives and seeking solutions that will have similar outcomes to the chemicals but without detrimental effects on the health of the people and the environment. We had an amazing turn out at our 2nd tour at Echo Point Park, Roseville Chase with over 70 people attending! A few of which snuck onto the tour! Unfortunately the weather put a dampener on the 2nd walk at Gibberagong, Bobbin Head, Ku-ring-gai Chase National Park. But the good news it has been postponed until August, so you have another opportunity to come along! Be guided by Les Mcleod, Aboriginal Discovery Ranger and Fran Bodkin, D’harawal Traditional Knowledge holder and Author. They have an abundance of stories and knowledge of our natural environment, culture, history, native food and medicinal plants. Dragonfly has an exciting new job in Warringah Council: Vertebrate Pest Control in Wildlife Protection Areas. Predation by cats is listed as a key threatening process under State and Federal legislation. Warringah Council has 19 reserves which are currently declared as Wildlife Protection Areas (WPA) under the Companion Animals Act 1998. These WPA declarations facilitate controls including the management of cats (feral and domestic) that are required to reduce the impacts of predation on native animals. Dragonfly Environmental cat trapping works aim to facilitate these controls in selected high conservation areas. 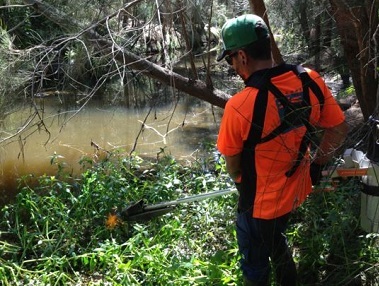 Works were undertaken in Allenby Reserve, Red Hill, Manly Dam and Jamieson Reserve, Narrabeen. During the trapping an abundance of fauna was seen and heard in the reserves, including Bandicoots, Goshawks, Microbats, Swamp Wallaby, Crakes and Red Crowned Toadlets. Hi I’m André Olson the Director and Founder of Dragonfly Environmental and I am very excited to present to you our inaugural newsletter. If you are receiving it, like me and the team at Dragonfly you no doubt share a similar Vision to ours which is “Cared For and Restored Natural Areas For Now and The Future”. This is our mantra and what motivates us to get out of bed every day.This vision began back in the days when Bush Regeneration was called “Tree Planting” and I had a modest team of 2-3 people working at sites such as Caddies Creek in McGraths Hill, doing basic weeding and planting. It was a great way to learn and great to see the improvement that could be achieved…. Little by little as confidence and trust grew in our abilities and expertise we are now specialists in managing wetland systems, riparian zones, terrestrial and landscaped areas stretching across NSW and Victoria.